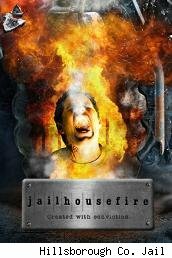 Calling it "murder on your taste buds" and "lethal," jail inmates in Florida are making and selling jailhouse fire hot sauce to the public as a way to add some spice to their food and add a little revenue to the inmate canteen. "It packs more heat than the heat," is one line used in a commercial for Jailhouse Fire hot sauces made by Hillsborough County inmates at the Falkenberg Road Jail as part of the horticulture training program. The three flavors are Original, Smoke and No Escape, which is billed as the hottest. Five-ounce bottles sell for $7. They were being sold for a part of a day last week outside the jail's main entrance, and they aren't sold in stores. But as the TV ad says of the hot sauces, only available online -- "It's not out yet, but you can order it online." Along with going into the inmate canteen, revenue also goes to culinary and horticulture programs for inmates. I've been to state prisons in California where inmates make artwork, piggybanks and other things to sell in the inmate store. They're a great way, prison officials say, to help the inmates channel some of their energy and learn a trade, such as woodworking. But making hot sauce and selling it online sounds like it would be a bigger seller. The inmates had been growing hot peppers for about a year as part of a horticulture program when one of them suggested making them into a commercial sauce, according to an Associated Press story. They spent two years perfecting the recipe, a hybrid of Caribbean-style hot sauce and a mustard sauce that includes habaneros, scotch bonnets and jalapenos. Inmates get to use some of their own sauce on their meals, which can be a bit bland in jail. "The food here is kind of institutionalized, so it helps," Allen Boatman, the horticulture program's director, told AP. Inmates have their own in-house version of Jailhouse Fire, which is considerably hotter than what they sell to the public. "It's a macho thing," Boatman said. "You know, 'I can eat the hottest pepper.'" To get the hottest version of the hot sauce, you'd have to do something you probably don't want to do -- commit a crime in Hillsborough County.